Dobby woven rayon with small diamond-shaped pattern; appliqué of blue, green, and red polka-dots. 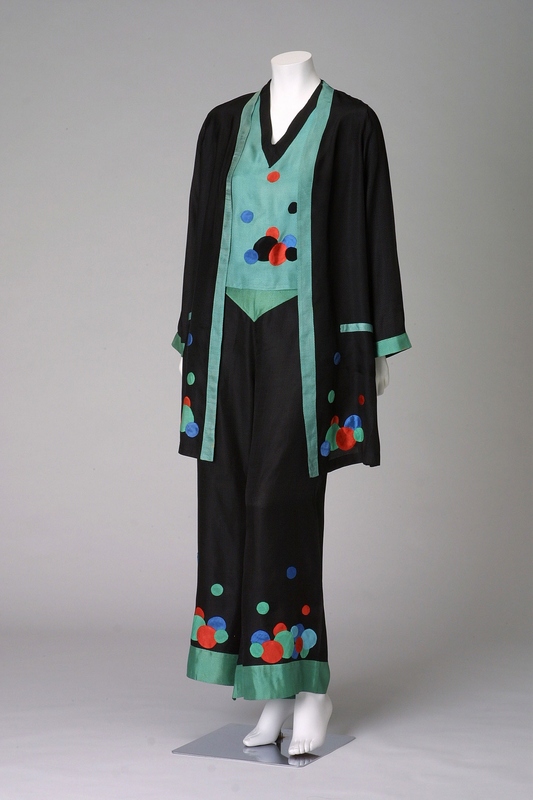 The rayon, which went into industrial production early in the 20th century, and contemporary fashions can be seen in the use of vivid coloring on black, and in the geometric and similar motifs of the irregularly-scattered large and small polka dots. Pajamas were introduced to the United Kingdom from India at the end of the 19th century and became popular as men's nightclothes, then they spread as fashionable indoor gowns for women in the 1920s. Since the latter half of the 1920s pajamas were worn as beachwear. Although women were not allowed to wear pants at official occasions at that time, they were a precursor to subsequent pants style.